Exodraft chimney fans (formerly called Exhausto chimney fans) are useful in certain situations where it just isn't possible to get a good enough draw on a chimney to make the fireplace or stove work properly. Commonly this is to do with chimney height, but there are also other factors that aren't easily remedied. So when all else fails the solution is an Exodraft Chimney Fan. Exodraft chimney fans are robust units are easily fitted to the top of the chimney with a set of controls positioned near the stove or fire that allow the fan to be adjusted to the desired speed. 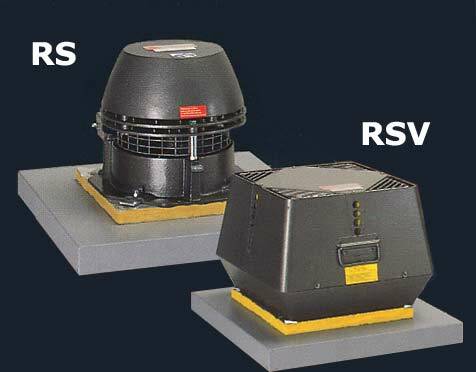 the RSV range, which comes in five different sizes and the RS range, which comes in six different sizes. The Exodraft fans can be used with gas, oil or solid fuel appliances and can withstand continuous flue gas temperatures of up to 250*C. They are hinged to provide easy access for maintenance and come with a two year warranty. To decide exactly which Exodraft fan is needed for your chimney all you have to do is fill out the appraisal form and email or post it to us (you can find our contact details on our contact page) and we will come straight back with all the information you need. You will then be able to choose which type of control you would like for your exodraft fan. The two main types of control used for the Exodraft Chimney Fans are the EFC 16, which turns the unit on and off and gives you infinite variation of the fan speed, and the temperature sensitive EFC 18, which will start when it detects temperatures over 40* C and stop when the fire goes out. All controls carry the two year warranty. We pride ourselves on offering a great service which we hope will quickly become apparent when you deal with us. At the same time we like to balance that by being competitive and we are keen for you to choose us. So if you are offered a better deal elsewhere then let us know and we will beat it.